An Advent Reflection: Are We Afraid of Silence? Are we afraid of silence? Think about it. The TV, radio, iPod, cell phone, game system, computer or other noise maker is always on. We are enrapt in our car, at the store, in our homes. We are distracted. Christmas time is no exception. It is busy and crazy. We have parties to attend, gifts to buy, gifts to wrap, cards to write, cookies to bake, and plays to attend. Plus, after all of that, we go to Mass. Do you know what? We don’t even like silence in the Mass anymore, even though it is just as important as the words. The Mass is a prayer. I can barely even get a prayer off after I receive Him in the Eucharist before music is blaring again. We are afraid of silence. It terrifies us. Our society is obsessed with noise. So, how do we slow down in the hustle and bustle of this season? How do we appreciate silence? First, we place Advent at the forefront right now. It is not Christmas, yet. Sure we still have to buy gifts, wrap, and write cards. That is fine. But, we should not be headlong into Christmas. Advent is a time of silence. A time of joyful hope. December is a dark month. It is the darkest month of the year. 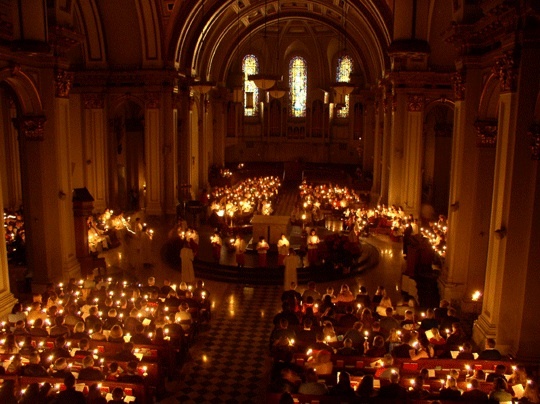 In lighting candles on each Sunday of Advent, we are witnessing to the hope that comes in Our Savior: the Light. We too wait for Him to come again, but we also wait, like the Israelites for his coming on Christmas. Take some time to pray and reflect each day on what O Come, O Come Emmanuel truly means. Light your Advent wreath and say a prayer, sing an Advent hymn, or enjoy the candle light. Prayer does not have to come with words. Sit and listen to God. See what He is trying to tell you in the busyness of your day. In this season of instant gratification, Christ is trying to teach us patience and hope. It is in the waiting that our anticipation builds. The real “magic” of Christmas does not come from reindeer, sleighs, and a man in a red suit who somewhat resembles St. Nicholas. The real joy of Christmas comes from a child lying in a manger. A child who, though is God, took on human flesh. He came to rescue us from ourselves. We are still waiting for His return. We are waiting to be re-united with Him. Advent reminds us of the deepest longings of our heart. It reminds us that nothing in this life can fulfill us. We only find joy and peace in Our Lord. The greatest Christmas gift cannot be bought in a store. The greatest gift was purchased at the price of God’s only Son, for our sake. Even though we are enslaved by sin, Christ came to free us. Shouldn’t we be giving Him more of our time? Shut off the TV, computer, iPod, game system, or whatever else distracts you. Spend some time in silence. Spend time contemplating what the coming of Our Savior means. Pray about His sacrifice for all. Imagine how the Israelites felt waiting for the Messiah for thousands of years. We know that Christ comes at Christmas, but they waited ages for Him. Embrace the beautiful season of Advent. I pray for Advent blessings on you and your family.